Patios are features attached to homes that can add something different to them. It is not like having a front porch or an addition built onto your home in that it creates a space for your family to live. However, it can be considered a space that you can use for your own purposes. Now, a really good patio in North Canton Ohio might look like a wooden floor built a foot or so over a yard that has a nice railing to prevent your children from falling off, or it might even be fully enclosed with wire netting that prevents the bugs from getting inside. If the patio looks like the latter then you can easily make that a nice relaxing spot in your home where you can grill, party and generally make a mess without having to stress too much about cleaning up after the fact. 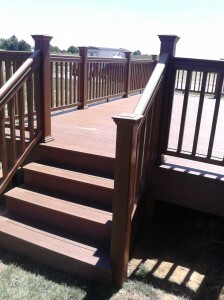 One of the great things about patios in North Canton Ohio is that we design them to function however you need them too. This might be that we put on extra finishes to make them more durable, or to make them easy to sweep off, or even to just have a patio that you can store some furniture on for comfort and relaxation. In any case, we will do our best to satisfy your needs.